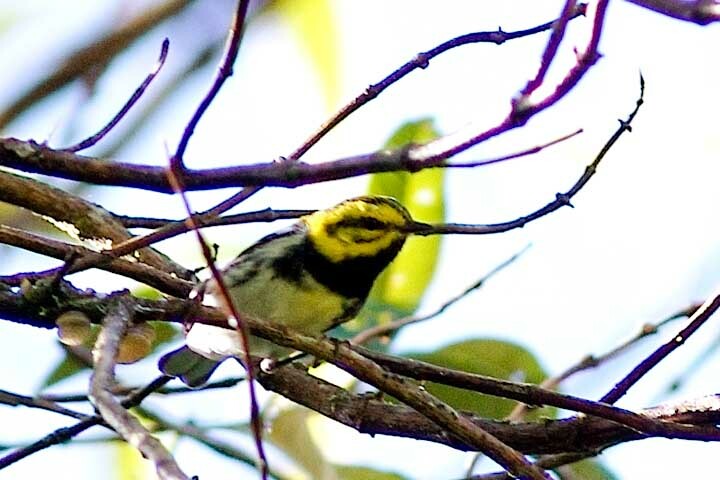 Rafael Luck sent in his photo of the male Golden-cheeked Warbler photographed above Cerro Punta on March 15, 2008. I don't think there is any Golden-cheeked in this bird. The crisp solid black throat indicates an adult male, which means the back, crown, and eyeline should be solid black, instead of olive or black-and-olive flecked as in this bird. In addition, there shouldn't be that much dark in the auriculars. The color of the underparts in the first picture are uncertain but in this picture they definitely look like they have a yellowish wash on the breast. That might still be light reflection though.